The University of Berlin, Prussia's first "reform university", was established in 1810. The status of Berlin as a center for mathematics grew in 1828 with the appointment of Peter Gustav Lejeune Dirichlet. In later decades, Leopold Kronecker and Immanuel Lazarus Fuchs added to Berlin's mathematical fame. During the Weimar Republic, Berlin once again became a magnet for mathematicians. In 1920, applied mathematics found its place in institutional mathematics with the appointment of Richard von Mises. Issai Schur, who held a professorship as of 1921, founded an important school of algebra. In the 18th century, before it became a center for mathematics, Berlin had become the cradle of Jewish enlightenment or Haskalah. The Haskalah is inextricably linked with the name of Moses Mendelssohn, an independent scholar who studied and investigated problems of philosophy, history and mathematics. 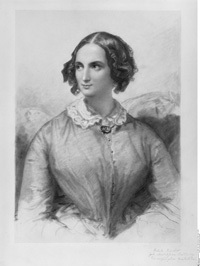 Rebecca Mendelssohn, Moses Mendelssohn’s granddaughter, married Johann Peter Gustav Lejeune Dirichlet in 1832. She became well-known as a salonnière and a friend of the arts and sciences. Although she had been baptized as a child, she remained conscious of her Jewish roots. Rebecca Dirichlet was highly interested in politics at a time when this was unusual for women. She welcomed the revolutionary developments of mid-nineteenth-century Europe because she hoped that they would bring about constitutional changes and that Jews might finally have the same civil rights as other citizens.